Closed-die forging from construction steels, high alloyed steels, stainless steels, Al- and Cu- alloys and special materials such as Titanium and Nimonic on BECHE 40MT and 35MT counter-blown hammers. On this type of equipment CPF forges large closed-die forgings up to 900 Kgs of unit weight for all segments of machinebuilding industries. Closed-die forging from construction steels, high alloyed steels, stainless steels, Al- and Cu- alloys and special materials such as Titanium and Nimonic on screw-hydraulic presses LVH 4000T and 2500T. On this type of equipment CPF forges large closed-die forgings up to 50 Kgs of unit weight for all segments of machinebuilding industries. Open-die forging from construction steels, high alloyed steels, stainless steels, Al- and Cu- alloys and special materials such as Titanium and Nimonic on hydraulic presses 800T and 630T. On this type of equipment CPF forges open-die forgings up to 4000 Kgs of unit weight for all segments of machinebuilding industries. CZECH PRECISON FORGE (CPF) is a traditional Czech company with international management with strong standing on world and domestic markets in closed-die forging and open-die forging. The roots of the CPF company stem from its past as a forge with a large range of products for global producers in power generation, marine industry, transport technology, aviation, oil industry, and other engineering sectors. Among the main production activities of CPF are closed-die forging and open-die forging of metal alloys, non-iron metals and specific materials to 4000 Kg of unit weight. An obvious part of the general production activity is in-house production of forging tools, own heat treatment processing, carrying out of destructive and non destructive testing, and surface correction including rough shot blasting and rough machining. Thanks to strategic alliances with domestic and foreign partners, CPF offers the final machining and laser cutting of selected types of products. 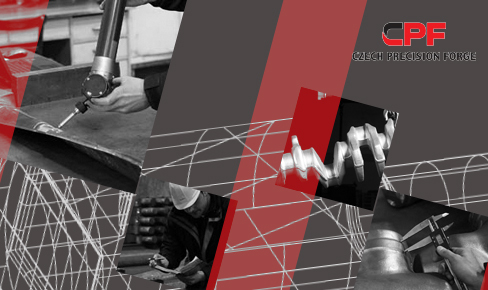 With its unique manufacturing facilities, certification, management ownership, language availability, and flexibility CPF offers to all customers its forging services in a form which is responsive to customer expectations and requirements. The amount of stock left on the surface of the forging to be removed by subsequent machining. Also called "machining allowance" or "forging envelope." CPF is Czech forge producing open-die (free) forgings, closed-die (drop) forgings, steel forgings, aluminium forgings, copper forgings, brass forgings, titanium forgings, nimomic forgings like p.e. forged turbine blades, forged compressor blades, forged connecting rods, forged gear wheels, forged crankshafts, forged valves, forged rings, forged shafts, forged propeller blades and other types of hot forgings. CPF is certified by ISO 9001, ISO TS 16949, Det Norske Veritas (DNV), American Bureau of Shipping (ABS), Lloyd's Register of Shipping (LR), Germanischer Lloyd (GL), RINA, TÜV, Korean Register of Shipping (KR), Nippon Kaiji Kyokai.